Hello there! I hope your aren't getting tired of seeing new posts from me lately. I have been on a bit of a roll. 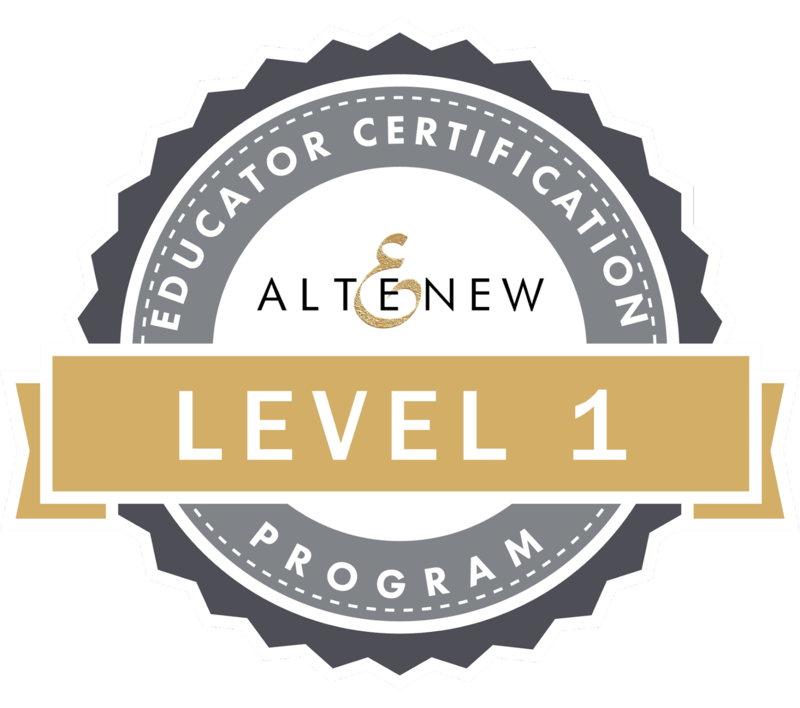 I completed my fourth class for the Altenew Educator Certification program. This class was entitled Easy Ink Blending Techniques. The title definitely speaks for itself. We jump into the world ink blending. It's full of lots of great techniques and tips. Although I am not using it in my card today, I was really taken with how they added extra details to ink blended pieces. It was very cool! I went with my favorite technique from the class, emboss resist. I started by cutting a piece of Bristol Smooth cardstock down to 4 1/4" x 5 1/2". Bristol is highly recommended for ink blending. The surface is extra smooth allowing for the inks to blend almost effortlessly. I broke out one of my newest Altenew sets, Frosted Garden. I am quite enamored with this set! I stamped one of the floral images with Versamark ink and stamped it in several places on the cardstock. 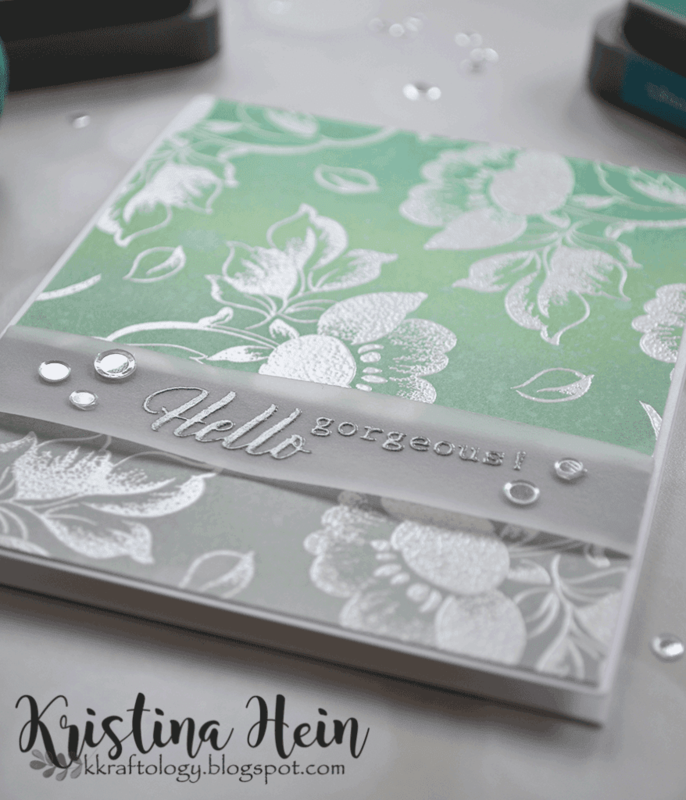 I then sprinkled a white pearl embossing powder over the stamped flowers and melted it with my heat tool. There were a few areas that I felt were too open so I went back with a very small leaf stamp. I repeated the stamping and heat embossing. Now, what colors to use for ink blending? Always so hard to choose! I tried to stay away from my favorites (blue and purple) and go outside of my box. After a little internet surfing I settled upon a green range. They are so pretty together! The colors are Pine Needles, Cracked Pistachio, Evergreen Bough and Iced Spruce. The last decision I need to make was whether to use regular Distress Inks or Distress Oxides. I settled on the oxides so that I would have a softer overall look. I worked my from darkest to lightest. I did use a foam blending tool to apply my inks. I applied all of the colors and then worked my way back to the beginning. This helps to smooth and blend the colors even further. The key is to work slowly. Don't be afraid to start light and keep building up your layers. You can't go lighter but you can always go darker! When I was happy with the blending I spritzed the entire piece lightly with water. I let it sit for about 10 seconds and blotted it up with a clean paper towel. I heat set it for just a bit to make sure it was fully dried. Now that I had this gorgeous blended panel I didn't want to cover up hardly any of it! I cut a strip of dark gray card stock and put it towards the bottom of the card. Then I cut a slightly wider piece of heavy vellum. After I treated it with anti-static powder, I stamped the sentiment using black Versafine ink. I sprinkled on the same white pearl embossing powder and used the heat tool. I really wanted the sentiment to have the same shimmer as the rest of the card. Plus I felt the black would be too harsh. It turned out as a dark silver. Very pretty! I did want to mention that the sentiments are from the same Frosted Garden stamp set. In order to attach the vellum I just wrapped the pieces of the strip around to the back of the card and used an adhesive tape to glue it in place. For a little bit extra I used some sparkling confetti sequins. I cut an 1/8" of an inch off of the top and one of the sides. I mounted it onto a white, A2 sized, top fold card base. I felt it would give the blended piece just a little bit of a pop. Oh Kristina, this is truly gorgeous! Love your share and write-up. Your ink-blending is nearly "seamless" with the use of vellum! I am sure this card is even more beautiful in person thanks to the embossing and Perfect Pearl! Thanks so much for entering your beautiful work in Altenew AECP assignment Gallery. Beautiful colors and design. Well done!